The Bald fire was reported on June 24, 2011, by the Yosemite Helitack, and Stanislaus National Forest’s Pilot and Smith Peak fire look-outs. It is suspected this is a lightning caused fire holdover, from the June 5, 2011 thunderstorms. Bald: (37 50.823x119 47.434, approximate el. 6,200’, Tuolumne Co.). Firefighters have lined 95% percent of the perimeter. The predicted cold front arrived on Tuesday with associated winds, but the hard work in the last two days, ahead of the storm, held the fire to 210 acres. It has been raining overnight, and Crane Flat Helibase has received approximately 1.89 inches of rain. Mop-up has begun and full containment is expected later today and full control later this week. The fire is in wilderness, but is within a zone where fires are put out due to threats to property, structures and other infrastructures. The fire is approximately 1.5 miles northwest of the community of Aspen Valley. Yosemite Firefighters are being assisted with “Hot Shot” crews from the Sequoia, Los Padres and Stanislaus National Forests and Sequoia National Park. Two Hot Shot crews and one Yosemite crew will be released today. The Sierra NF Helicopter 520 was released the evening of June 28. Many fires have occurred in this area over the years due to lightning; the largest being the 1996 Ackerson Fire. That fire burned over 60 thousand acres in the Park. Minimum Impact Suppression Tactics (MIST) continue to be utilized by firefighters to minimize impacts to wilderness: for example, utilizing natural fires breaks of rock areas rather than cut hand line. The Cottonwood/Ackerson Trailheads, access to Aspen Valley, remain closed to hikers and pack stock. Fire and Wilderness managers will determine today when to reopen the trail. Cottonwood: (37.9043x119.8024, 5,000’ el., Tuolumne Co.) This fire was found on June 6, 2011, after a thunderstorm of June 5. The fire is in patrol status, and will monitored on a regular basis. 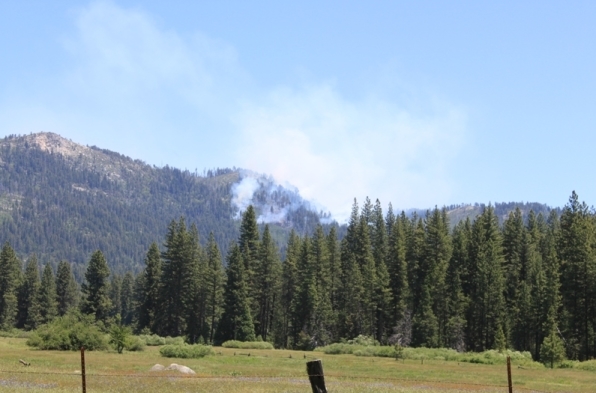 Smoke from the Bald Fire is visible from the Tioga Rd., west of White Wolf, and along the Evergreen Rd., near Ackerson Meadow, and in locations along Highway 120 into the park from Buck Meadows and Groveland. It is dispersing toward the northeast from the Bald Fire. This fire is remote and has not posed health or driving hazards from smoke. A new fire, the Bald, was reported on June 24, 2011, by the Yosemite Helitack, and Stanislaus National Forest’s Pilot and Smith Peak fire look-outs. It is suspected this is a lightning caused fire holdover, from the June 5, 2011 thunderstorms. Bald Incident(Wildfire): The fire is now 210 acres. Fire activity has remained moderate and is moving to the northeast. Cause: The suspected cause is lightning of June 5, 2011. Location: The fire is in wilderness, but is within a zone where fires are put out due to threats to property, structures and other infrastructures. The fire is approximately 1.5 miles northwest of the community of Aspen Valley. (37 50.823x119 47.434, approximate el. 6,200’, Tuolumne Co.). Resources: Yosemite Firefighters are being assisted with “Hot Shot” crews from the Sequoia, Los Padres and Stanislaus National Forests and Sequoia National Park. In addition, the Stanislaus and Sierra National Forest Helicopters will assist with air operations with water bucket drops and equipment hauling. A total of 130 firefighters and overhead are assigned. Terrain/Fire behavior: Many fires have occurred in this area over the years due to lightning, the largest being the 1996 Ackerson Fire, which burned over 60 thousand acres in the Park. The fire is burning in a remote area and the terrain is steep and rugged. Firefighters indicated there was a moderate rate of fire spread and spotting through the brush. Minimum Impact Suppression Tactics (MIST) are being utilized by firefighters to minimize impacts to wilderness: for example, utilizing natural fires breaks of rock areas rather than cut hand line. Closures: The Cottonwood/Ackerson Trailheads, access to Aspen Valley, are now blocked, signed and closed to hikers and pack stock. Air Quality: Smoke from the Bald Fire is visible from the Tioga Rd., west of White Wolf, and along the Evergreen Rd., near Ackerson Meadow, and in locations along Highway 120 into the park from Buck Meadows and Groveland. It is dispersing toward the northeast from the Bald Fire. This fire is remote and has not posed health or driving hazards from smoke. A new fire, the Bald, was reported on June 24, 2011, by the Yosemite Helitack, and Stanislaus National Forest’s Pilot and Smith Peak fire look-outs. It is suspected this is a lightning caused fire holdover, from the June 5, 2011 thunderstorms. Fire crews will investigate the site of the origin for cause determination. Bald Incident(Wildfire): (37 50.823x119 47.434, approximate el. 6,200’, Tuolumne Co.). The fire is approximately 150 plus acres in size. Fire activity increased in the afternoon on June 25, 20111, moving toward the east. The suspected cause is lightning of June 5, 2011. The fire is in wilderness, but is within a zone where fires are put out due to threats to property, structures and other infrastructures. The fire is approximately 1.5 miles northwest of the community of Aspen Valley. Many fires have occurred in this area over the years due to lightning, the largest being the 1996 Ackerson Fire, which burned over 60 thousand acres in the Park. Fire behavior: The fire is burning in a remote area and the terrain is steep and rugged. Firefighters indicated there was a moderate rate of fire spread and spotting through the brush. Minimum Impact Suppression Tactics (MIST) are being utilized by firefighters to minimize impacts to wilderness. For example, utilizing natural fires breaks of rock areas rather than cut hand line. Planned Actions: Today, Yosemite Firefighters will be joined by “Hot Shot” crews from the Sequoia and Stanislaus National Forests and Sequoia National Park. In addition, the Stanislaus National Forest Helicopter will assist with air operations with water bucket drops and equipment hauling. Additional resources have been ordered including two more 20 person Hot Shot crews. A total of 130 firefighters will be on scene for tomorrow’s operational period. Air Quality: Smoke from the Bald Fire is visible from the Tioga Rd., west of White Wolf, and along the Evergreen Rd., near Ackerson Meadow, and in some locations along Highway 120 into the park from Buck Meadows. It is dispersing toward the northeast from the Bald Fire. This fire is remote will pose no health or driving hazards from smoke. 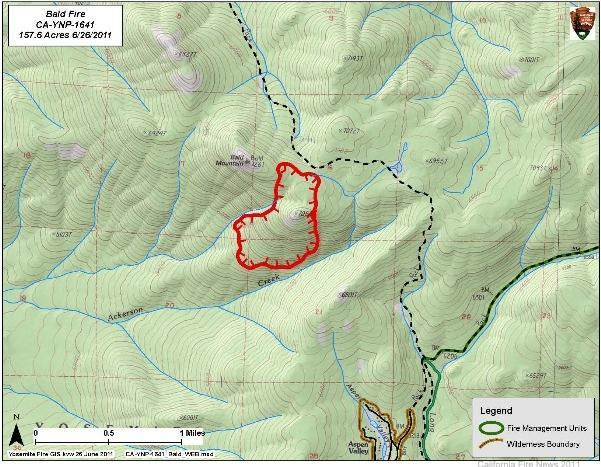 The Bald Fire was found in the afternoon of June 24, 2011 by Crane Flat, Pilot Peak and Smith Peak fire lookouts. Although the fire is in designated wilderness, the fire is in Yosemite National Park's suppression zone and is being put out. As of June 26, the fire has burned approximately 210 acres. 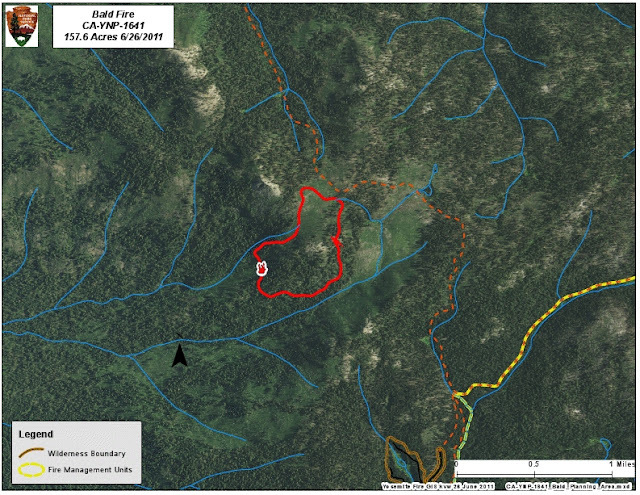 The fire is within the footprint of the 1996 Ackerson Meadow Fire, the largest wildfire in recorded Yosemite National Park history. The fire is visible from many locations in the northwest protion of the park. The fire is remote and the terrain is steep and rugged. One hundred and thirty firefighters are assigned to the fire, including five "Hot Shot" crews, and three Type 2 Helocopters. As designated Wilderness area, Minimum Impact Suppression Tactics (MIST) are being employed for this fire. By example, firefighters are utilizing natural barriers as rock outcroppings to check fire spread, rahter than heavy line construction. Location Yosemite National Park, Tuolumne County Yosemite National Park. Aspen Valley, Near Bald Mountain NPS. 13 miles northwest of Yosemite Village, CA. Fuels Involved Timber & white thorn. Fire is actively burning in an old fire scar which contains Heavy down slash and timber - 10 Timber litter,brush and atanding and down dead trees. Fire BehaviorModerate rates of spread,short range spotting, with short runs in the brush. Medium potential for growth. Outlook/Planned Actions Fire crews continue direct line construction where possible and are utilizing helocopter water bucket work as needed. Growth Potential Medium potential with current weather and predicted weather. Terrain Difficulty Steep and rugged. Due to the fire's location in designated Wilderness, Minimum Impact Suppression Tactics are being utilized. Fire access is difficult due to the remote location. Fire Crews are spiking out and/or are hiking out after each day operational period. Incident is in the wilderness with steep inaccessible terrain, ground resources in approx 2 miles.